Definition at line 94 of file stream-tcp-private.h. Definition at line 114 of file stream-tcp-private.h. Referenced by StreamNeedsReassembly(), and StreamTcpPruneSession(). seq where we are left with reassebly. Matches STREAM_BASE_OFFSET below. Definition at line 112 of file stream-tcp-private.h. Referenced by StreamNeedsReassembly(), StreamReassembleRawUpdateProgress(), StreamTcpPruneSession(), StreamTcpReassembleDepthReached(), StreamTcpReassembleHandleSegmentHandleData(), StreamTcpReassembleInsertSegment(), StreamTcpUTSetupStream(), and TcpSegmentCompare(). Definition at line 95 of file stream-tcp-private.h. Referenced by AppLayerIncTxCounter(), DetectEngineInspectStream(), FlowGetDisruptionFlags(), RegisterSSLParsers(), SigMatchSignaturesGetSgh(), StreamNeedsReassembly(), StreamReassembleLog(), StreamReassembleRaw(), StreamReassembleRawHasDataReady(), StreamReassembleRawUpdateProgress(), StreamTcpDetectLogFlush(), StreamTcpFreeConfig(), StreamTcpPacket(), StreamTcpPruneSession(), StreamTcpReassembleAppLayer(), StreamTcpReassembleDepthReached(), StreamTcpReassembleHandleSegment(), StreamTcpReassembleHandleSegmentHandleData(), StreamTcpReassembleInsertSegment(), StreamTcpReassembleTriggerRawReassembly(), StreamTcpSetDisableRawReassemblyFlag(), StreamTcpSetSessionNoReassemblyFlag(), and StreamTcpThreadDeinit(). Definition at line 101 of file stream-tcp-private.h. 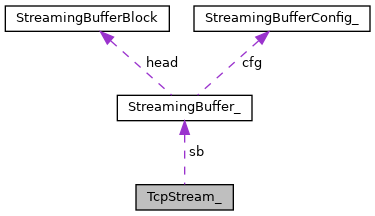 Referenced by AppLayerIncTxCounter(), DetectStreamSizeFree(), DetectStreamSizeRegister(), StreamTcpPacket(), StreamTcpReassembleDepthReached(), StreamTcpThreadDeinit(), StreamTcpUTSetupStream(), and UTHAddSessionToFlow(). Definition at line 103 of file stream-tcp-private.h. Referenced by AppLayerIncTxCounter(), StreamNeedsReassembly(), StreamReassembleRawUpdateProgress(), StreamTcpPacket(), StreamTcpPseudoPacketCreateStreamEndPacket(), StreamTcpReassembleHandleSegmentHandleData(), StreamTcpReassembleInsertSegment(), StreamTcpSackFreeList(), StreamTcpSackPruneList(), StreamTcpSackUpdatePacket(), StreamTcpSegmentForEach(), StreamTcpThreadDeinit(), TcpSackCompare(), TcpSegmentCompare(), and UTHAddStreamToFlow(). Definition at line 108 of file stream-tcp-private.h. Definition at line 107 of file stream-tcp-private.h. Definition at line 116 of file stream-tcp-private.h. Definition at line 118 of file stream-tcp-private.h. Referenced by StreamReassembleRawUpdateProgress(), StreamTcpReassembleInsertSegment(), and StreamTcpReassemblySetMinInspectDepth(). Definition at line 102 of file stream-tcp-private.h. Referenced by DetectStreamSizeFree(), DetectStreamSizeRegister(), StreamNeedsReassembly(), StreamTcpPseudoPacketCreateStreamEndPacket(), and StreamTcpThreadDeinit(). Definition at line 104 of file stream-tcp-private.h. Referenced by StreamTcpSackUpdatePacket(), and StreamTcpThreadDeinit(). Definition at line 98 of file stream-tcp-private.h. Referenced by StreamTcpReassembleHandleSegmentHandleData(), StreamTcpSetOSPolicy(), StreamTcpThreadDeinit(), and TcpSegmentCompare(). Definition at line 115 of file stream-tcp-private.h. Referenced by StreamReassembleRawUpdateProgress(), and StreamTcpPruneSession(). combined size of the SACK ranges currently in our tree. Updated at INSERT/REMOVE time. Definition at line 125 of file stream-tcp-private.h. Referenced by StreamTcpSackFreeList(), StreamTcpSackPruneList(), and TcpSackCompare(). red back tree of TCP SACK records. Definition at line 127 of file stream-tcp-private.h. Definition at line 121 of file stream-tcp-private.h. Referenced by StreamNeedsReassembly(), StreamReassembleRawHasDataReady(), StreamReassembleRawUpdateProgress(), StreamTcpCheckStreamContents(), StreamTcpFreeConfig(), StreamTcpInlineSegmentCompare(), StreamTcpInlineSegmentReplacePacket(), StreamTcpPruneSession(), StreamTcpReassembleAppLayer(), StreamTcpReassembleInsertSegment(), StreamTcpSegmentForEach(), StreamTcpStreamCleanup(), StreamTcpUTSetupSession(), StreamTcpUTSetupStream(), TcpSegmentCompare(), UTHAddSessionToFlow(), and UTHAddStreamToFlow(). Definition at line 122 of file stream-tcp-private.h. Referenced by StreamNeedsReassembly(), StreamReassembleRawHasDataReady(), StreamTcpPruneSession(), StreamTcpPseudoPacketCreateStreamEndPacket(), StreamTcpReassembleAppLayer(), StreamTcpReassembleHandleSegmentHandleData(), StreamTcpReassembleInsertSegment(), StreamTcpReturnStreamSegments(), StreamTcpSegmentForEach(), StreamTcpUTAddSegmentWithByte(), TcpSegmentCompare(), and TmModuleFlowRecyclerRegister(). Definition at line 123 of file stream-tcp-private.h. Definition at line 99 of file stream-tcp-private.h. Definition at line 105 of file stream-tcp-private.h. Referenced by StreamNeedsReassembly(), StreamReassembleRawUpdateProgress(), StreamTcpReassembleInsertSegment(), StreamTcpSackFreeList(), StreamTcpThreadDeinit(), and TcpSackCompare(). Definition at line 97 of file stream-tcp-private.h.